Irish ornament features a pot o' gold at the end of the rainbow. This Irish ornament is from Kurt S. Adler. 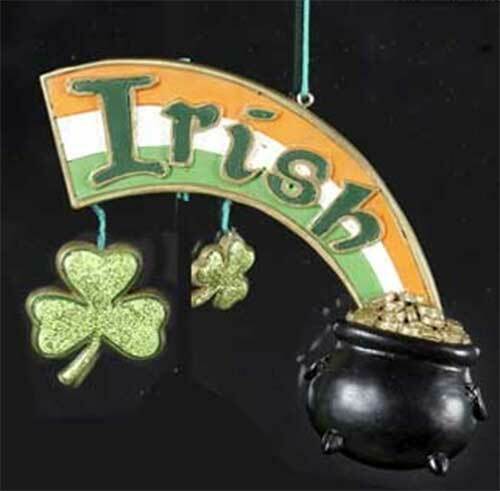 A pot o' gold is found at the end of each rainbow and this Irish Christmas ornament is no different. The pot o' gold ornament is a dimensional design that is enhanced with dangling shamrocks along with a colorful rainbow and the word Irish. The Irish rainbow ornament measures 4 1/2" wide by 4 1/2" tall; it is made of resin. The Irish ornament is ready to hang on your Christmas tree with the included green string and it is gift boxed with a shamrock history card, complements of The Irish Gift House. Irish Christmas tree ornament features a tall derby hat along with dangling shamrocks. Irish Christmas tree ornament features lucky charms along with a rainbow banner that states, Luck o' the Irish.